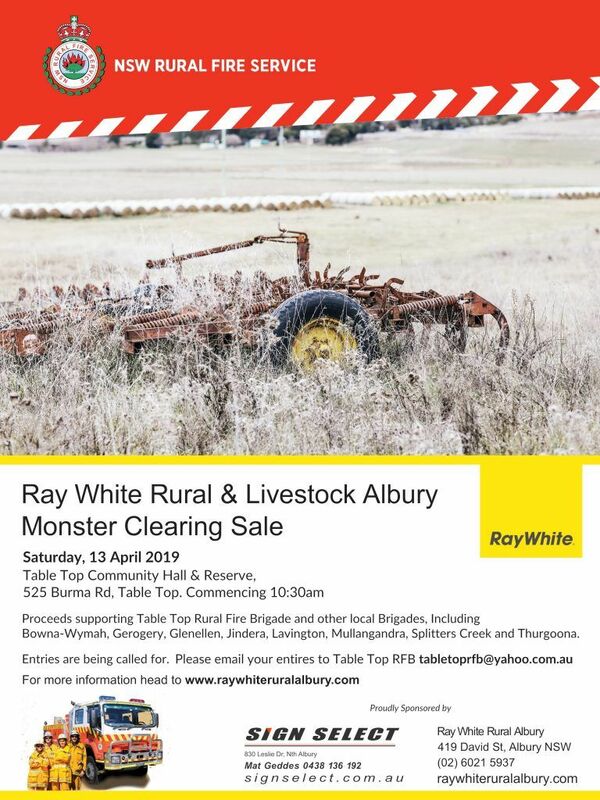 As a major fundraising initiative, Ray White Rural Albury has joined with the Table Top Rural Fire Brigade (TTRFB) to run a Monster Clearing Sale at 10.30am on Saturday 13 April 2019. All funds from the sale of donated items go to the RFS Brigade of the vendor’s choice (several brigades around Albury are participating and will be beneficiaries), or alternatively, the commission from items sold is donated to a nominated brigade by Ray White Rural Albury. A hard-working committee consisting of both Ray White Rural Albury staff and TTRFB members are putting the day together, holding regular meetings and all attending to the myriad of jobs to be done in order to run a successful clearing sale. Ray White Rural Albury is donating their time and foregoing commissions to ensure maximum funds are raised for the Rural Fire Service. Hugh Watson from Ray White Rural Albury, and also President and long-time supporter of the TTRFB suggested the idea late last year and it’s now coming to fruition. We now need to encourage as many entries as possible and promote the more unusual or significant entries on social media. Please call me if you need any more info or when you need an update.